Generations Literary Journal publishes the original works and ideas of both emerging and established artists in an effort to encourage conversations across the generational gaps. The gaps can come from almost anywhere—misunderstandings, lack of communication, apathy, cultural differences, time, access, or distance. 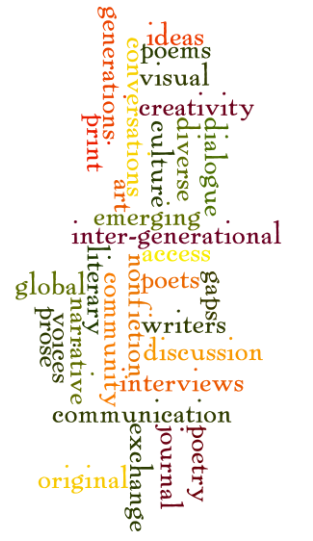 To that end, we print page and stage poetry, short fiction, personal narratives, interviews, and visual art from every generation in hopes of filling the gaps with positive discussion and interaction across the age divide. With special thematic issues, we aim to feature the diverse voices of our global community and to promote cultural exchange and inter-generational dialogue. Our past contributors are widely published authors, first time in print writers/artists, and teen writers/artists.